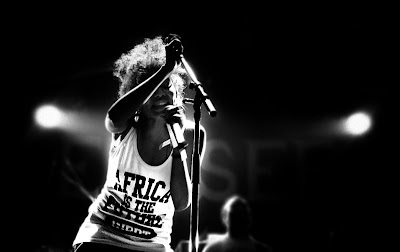 Nigerian-German soul singer and rapper Nneka made a splash last year with Heartbeats, a stuttering soul stomp with a chart-friendly Chase & Status remix . It got to number 20 in the UK, justifying MOBO's decision to award Nneka their "Best African Artist" prize 12 months earlier. The single fared well over in the US, too, thanks to a reggaeton remix with Nas. Consequently, the 31-year-old is getting a major stateside push for her new album, Soul Is Heavy. Most artists looking to break North America would play it safe - calling up Will.i.am or Dr Luke for an easy hit to ease them into the public conciousness. Not this lady. If that all sounds a bit too worthy then (a) shame on you and (b) you'll be pleasantly surprised. Nneka knows how to make her message palatable - blending hip-hop beats with plaintive soul vocals and bouncy Afro-pop. Why bother waiting another 13 years for a new Lauryn Hill album, when Nneka is every bit her equal?